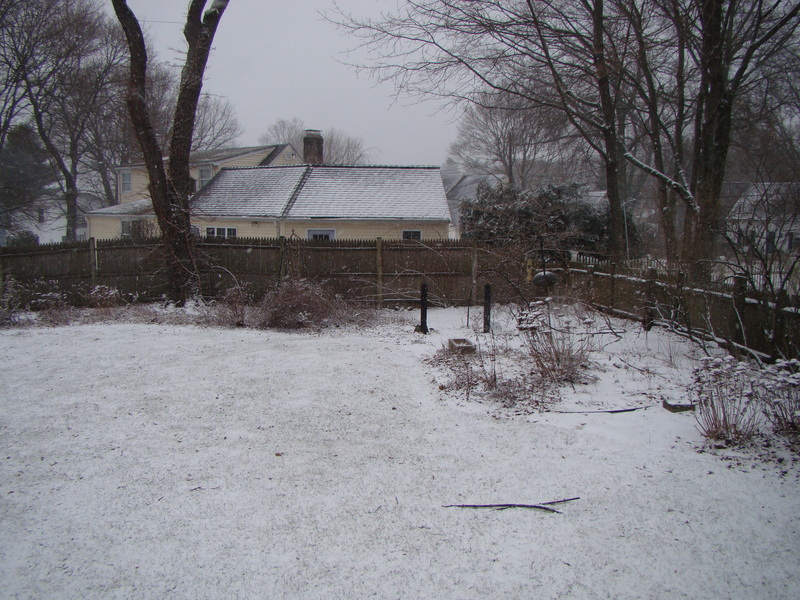 The Blizzard of 2013 has come and mostly gone from the Boston area. The eastern part of the state is still under a travel ban until 4 pm. I applaud the governor for proactively keeping people off the roads. I’m sure it went a long way towards the seemingly seamless cleanup effort that has taken place so far. There are power outages in some area, mostly southeast of the city (we are northwest of the city). For a variety of reasons, the public transit system remains down, but hopes to be up and running for the Monday commute. Officials are urging all to be patient, a virtue that Americans often seem short on. I’m happily settled in for the rest of the day with a cup of tea and a book (Jill Lepore’s The Story of America: Essays on Origins). 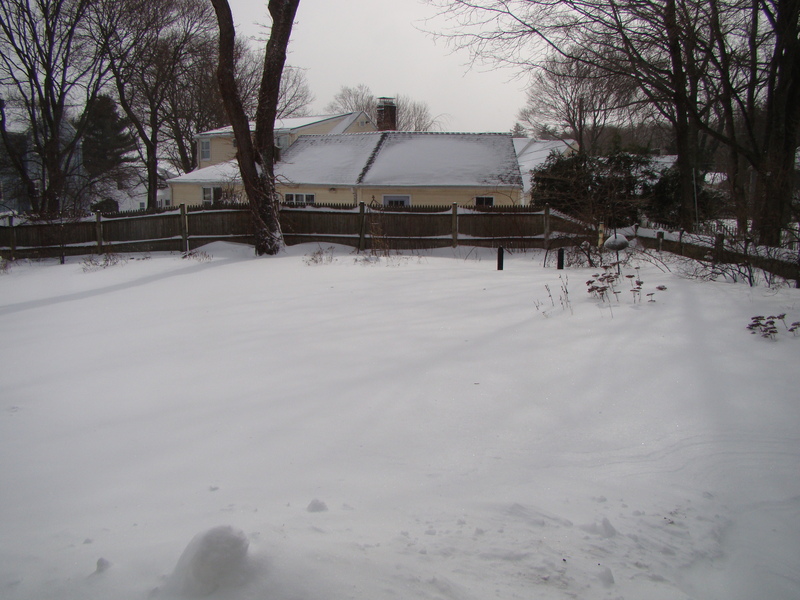 I estimate we got about 27 inches of snow. It’s a little hard to judge because of the heavy drifting. Thank goodness the snow blower was successfully fixed! 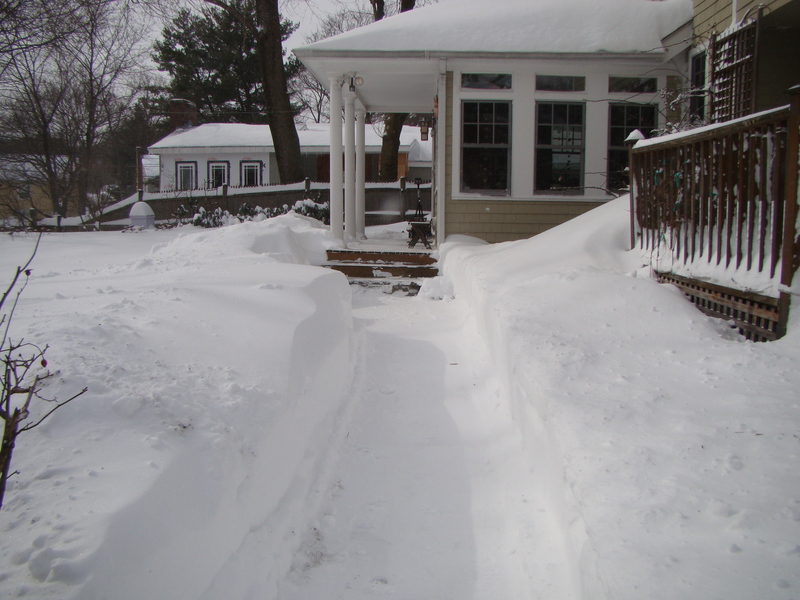 Howard did a few passes with the heavy equipment, and I supplemented with the shovel. We were cleared out and ready for action by around noon. What’s the perfect lunch for a snowy day? I always vote for tomato soup and grilled cheese sandwiches. I made a pot of soup yesterday in anticipation of the storm, and it definitely hit the spot today. 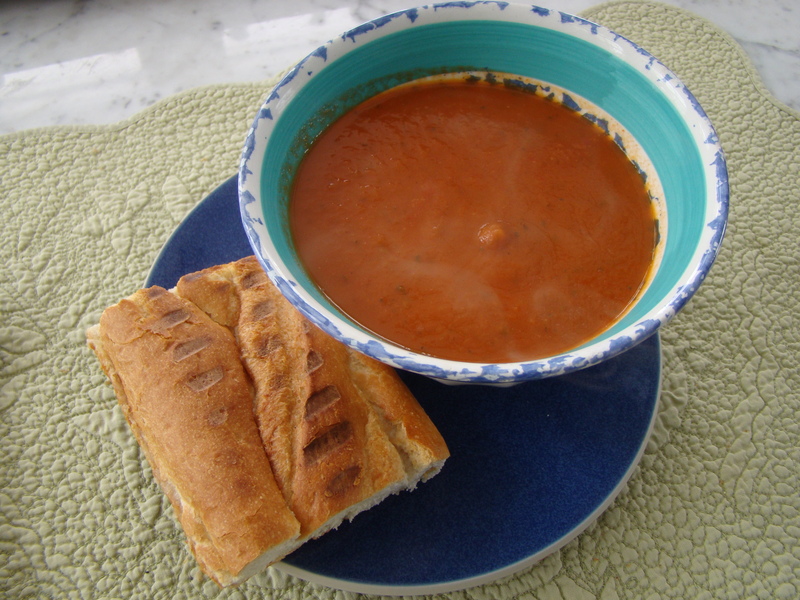 This recipe was quick and easy and uses canned tomatoes, a staple in my pantry. I used garden basil that I froze in ice cube trays at the end of the summer which gave the soup a hint of a warmer season. Stir in the tomatoes and their juices, plus the water, and bring to a boil. Reduce the heat to low and simmer, stirring occasionally, until the flavors have melded, about 30 minutes. Add the basil, season with salt and pepper, remove from the heat, and let cool briefly, about 5 minutes. Set a medium-mesh strainer over a large, heatproof bowl. Using a blender, purée the soup in batches until smooth. Pour the blended soup through the strainer. Stir and press on the solids with a rubber spatula to force what you can through the strainer. Scrape into the bowl any tomato that goes through the strainer but sticks to the outside. Discard any solids that don’t go through strainer. It won’t be that much. Taste the soup and season with additional salt and pepper as needed. Return the soup to the saucepan and reheat until hot.